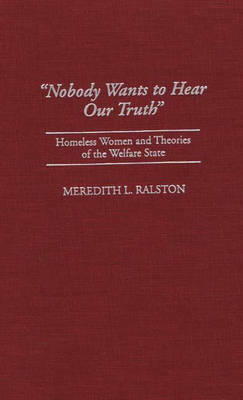 Through interviews with 20 homeless and addicted women over a time frame of five years, the author vividly demonstrates how sexual abuse, sexism, and racism are at the base of their problems and how both neo-conservative and neo-liberal theories and prescriptions for solving their problems are unworkable. The author considers the problems of homelessness and addiction and how these problems are linked. She continues by providing statistical profiles of all the interviewees. Ralston outlines the feminist methodology used in the research and raises major questions regarding these issues. She defines and tests the main theories in relation to the women's experiences and perspectives and Uncovers new realities about the situations and problems of welfare recipients and people whom society has usually silenced.